Below is the Quadrennial (2013-2016) report that was submitted to the Southeastern Jurisdiction Committee on Coordination and Accountability. Please email us at sejinfo@umvim.org if you have any questions or comments. A list of the our Core Values can be found on our website. The Board of Directors held a Visioning Retreat in August 2015 to look at the focus and direction for UMVIM, SEJ for the next quadrennial. They will be working on a new strategic plan for that time frame. Each year, nearly 10,000 volunteers from the Southeastern Jurisdiction serve in short-term mission service. The online process for teams to register their short-term service has allowed for better statistics and data. From 2013 through 2015, 2,117 teams registered who served internationally and 438 teams in the United States reflecting a total of 27,921 volunteers. Most of the short-term volunteers serve in the Caribbean and Central America with the majority of teams serving in Costa Rica, Haiti, Honduras, Bahamas, and Guatemala. Congregational Development - This is the primary focus of most of the short-term volunteer teams. Internationally, there were 1,339 construction teams most assisting in the building of churches. In addition to building new churches, teams and long-term Mission Volunteers provide resources and training for churches, both new and existing, along with their pastors – 396 teams were engaged in education, evangelism, and Bible Schools. UMVIM, SEJ short-term teams continue to serve with Global Ministries Mission initiatives, helping to build new places for worship and ministry, and assisting missionaries with resources and evangelism for planting new churches. Leadership Development - UMVIM, SEJ formalized “Best Practices for UMVIM teams” which are being encouraged by all jurisdictions. These practices provide a standard expectation by church and project leadership, and insure appropriate management and accountability. One of the “best practices” is having a trained team leader. The UMVIM “Train the Trainers” program provides qualified trainers that are equipped to train team leaders in their respective annual conferences. This has allowed UMVIM, SEJ to have trainers in annual conferences to schedule UMVIM Team Leader Trainings as needed. I have done Team Leader “Train the Trainers” in 13 of the 15 annual conferences (two twice) and there are currently 141 trainers in the Southeastern Jurisdiction. UMVIM, SEJ revised the team leader handbook and training resources in early 2015. Ministry with the Poor - Most UMVIM projects are located in areas where poverty exists, and volunteers work in those communities to help people gain access to resources such as food, housing, education and work to empower them to create ways to escape the cycle of poverty. Because one of the major issues encountered is the urgent need for food, teams serve with established projects and initiatives to provide immediate food sources to assist families. More volunteers are involved in creating sustainable agricultural programs that develop techniques and methods to produce better and more diversified crops. During 2014, we highlighted our projects in the Southeastern Jurisdiction that focus on ministry with the poor. You can read the Mission Highlight about Rural Projects that work to end generational poverty on our blog. Global Health - Short-term medical teams from the Southeastern Jurisdiction serve in numerous countries. All aspects of medical care and surgery are performed, including treatment of malaria and AIDS. There is also a new focus on identifying and training a community-based health promoter. Alabama Honduras Medical Education Network (AHMEN) and Servants in Faith and Technology (SIFAT) have partnered together to provide this type of training program in Honduras. Although teams were discouraged to serve during the Ebola crisis, we provided awareness of the situation in the Mission Highlight on Kip and Nancy Robinson, missionaries from the SEJ serving in Sierra Leone before and after the Ebola crisis which can be read on our blog. Implementing Board Restructure Plan - Restructuring has reduced the board membership from 34 members to fifteen, and reorganized the teams/committees into areas determined by our Strategic Plan. It also created the UMVIM Advisory Team (consisting of two representatives from each annual conference, including the Conference UMVIM Coordinators serving as a pool from which board and committee members may be selected). The restructure has allowed us to focus on orientation for new Conference UMVIM Coordinators and selecting board members with a diversity of leadership skills and backgrounds. The Board of Directors meets at least twice annually. Conference UMVIM Coordinators have become a networking group who meet annually. Thirteen of the fifteen Conference UMVIM Coordinators met at ReelFoot Rural Ministries in the Memphis Conference for the 2015 annual meeting. They will meet in the Alabama-West Florida Conference during 2016. Strengthening the Brand - Creating strategies that will make UMVIM visible to local church congregations, including branding all organizational items such as the website, printed materials and displays for a uniformed and standardized look. UMVIM, SEJ staff speak and have displays at local churches and events. We have visited 14 of the 15 annual conferences since 2013 and plan to intentional visit every annual conference before the end of the quadrennial. Building Connectional Relationships - Maintaining connection through training and resources with the annual conferences and local churches regarding short-term missions is important part of the ministry of UMVIM, SEJ. Providing information and resources for volunteers, missionaries and project leader continues to be needed. Using technology such as Skype to dialogue and communicate with missionaries and church leaders without having to travel will be vital to sustaining connectional relationships. UMVIM, SEJ suggested changes the forms and format for the International UMVIM Opportunities for Teams list putting the focus on the types of opportunities in relation with our missionaries and project leaders. This list is available for download on our website. UMVIM, SEJ collaborates with United Methodist Committee of Relief and the SEJ Disaster Response Coordinators to plan and implement an annual SEJ Disaster Academy. The SEJ Disaster Academy brings together annual conferences to train and discuss better ways of addressing relief, recovery and rebuilding in affected areas. It also allows us to share the continued needs of those areas that are in recovery. Many of the Conference UMVIM Coordinators attend the SEJ Disaster Academy. February 23-27, 2015 at Seashore Assembly in Biloxi, MS, the Academy was an opportunity to remember and share reflections of Katrina (10 Years After Katrina). I encourage you to read our blog post. Additionally, we assist annual conference in volunteer management training as part of the recovery process. Annually, the five jurisdictional UMVIM Coordinators meeting in collaborative with Global Ministries Mission Volunteer staff. Additional, we assist with Global Ministries Mission Volunteer trainings for long-term volunteers which is usually once a year as well as project leaders and missionaries. November 2014, I assisted Global Ministries Mission Volunteers with training in South Africa for project leaders and missionaries who host volunteers. There were 16 participants from the following countries: Democratic Republic of Congo, Malawi, Mozambique, South Africa, Zambia, and Zimbabwe. During May 2015, I took an exploratory team to visit with Global Ministries missionaries, Eric and Liz Soard, who serve in Tanzania. The goals in visiting all of the local United Methodist Churches in the Lake Victoria area is to connect them with United Methodist Churches in Alabama. Three churches in the Birmingham, AL area will be collaborating to build relationships with the churches in the Geita District of Tanzania. They will be taking a small group in the fall of 2016 to discuss how to create partnerships between the churches. Churches in the Alabama-West Florida conference will be creating partnerships with churches in the Mwanza area of Tanzania. Visit our blog to read more about what the Soards are doing to build meaningful relationships in Tanzania. Creating Opportunities for a New Generation of Volunteers in Mission - Recruiting and training youth leaders and providing opportunities that are easy for leadership logistically is a major focus. “GO!”, our program for youth and young adults, serves as an introduction to UMVIM for those who have never served with us before. It provides hands-on training and guidance to the team leader during the planning process and gives students the opportunity to serve. UMVIM, SEJ coordinates the annual Young People in Mission (YPIM) event held at Lake Junaluska. Each year, a Design Team is selected to plan and implement the next year’s event. The team is comprised of young people in high school and college. The 2016 YPIM Design Team has met to plan the June 26-30 event. The theme will be “The Living Word, Living the Word”. UMVIM, SEJ staff continues to provide information and resources to colleges and universities, helping them discern connection with mission projects. I met with the Auburn Wesley Foundation director, Rev. David Goolsby, in Auburn, Alabama, who led a student team to serve in Tanzania with the Soards in June 2015. The UMVIM, SEJ Summer College Intern Program gives students an opportunity to engage in both domestic and international mission opportunities, and is a time of encouragement and discernment for them. The first intern was Kylie Foley in 2013. She is served as the Imagine No Malaria Coordinator for the Florida Conference until the end of 2015. Our 2014 intern was Laura Kigweba of the Memphis Conference and graduate of Wesley Theological Seminary, is currently serving at Mount Vernon Place United Methodist Church in Baltimore, MD. Lindsey Brown served as the 2015 Intern. Her domestic placement was with Alabama Rural Ministries and Young People in Mission event. She served with Rice and Beans in Costa Rica as her international placement. Returning to complete her senior year as a nursing student at Union University in Jackson, TN., Lindsey hopes to become a missionary after graduation. Until 2015, almost 70% of UMVIM, SEJ’s current revenue is generated through the services offered by our office, such as the insurance and processing fees and the sale of team leader handbooks. In the past, registration fees offset the declining amount of support from the Jurisdiction, and the new online registration process has reduced the need for additional staff to enter data. In 2015, we received an UMCOR grant to assist with a new staff position, Disaster Response Liaison. UMVIM, SEJ received substantial support through “Giving Tuesday” almost meeting our annual goal of $75,000 and receiving $16,475 in matching funds from The Advance. We are encouraged that donors are using “Giving Tuesday” as an opportunity to increase their contributions through The Advance matching funds. Since moving the office to Birmingham, UMVIM, SEJ has experience several changes in staff. Landon Taylor was hired July 15, 2013 to specifically focus on creating ways for churches and individuals to partner with us financially. We are looking for opportunities using diverse forms of communication, including social media, to offer opportunities for investing in the ministries of UMVIM, SEJ. Landon has worked with the Development Team and Chrissy Booth to create development strategies and goals. The UMVIM, SEJ board developed an Endowment Plan to continue vital programs for young people and there is $50,000 of matching funds for contributions made to the Endowment Fund. UMVIM, SEJ assets are cash and cash equivalents, restricted funds and office furnishings (including computers, printers, and servers). Each year we have an independent audit done and the report is given to the UMVIM, SEJ Board and the SEJ Committee on Coordination and Accountability. 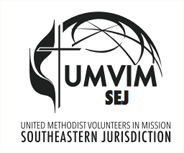 UMVIM, SEJ is an incorporated non-profit organization. The executive director is hired by its Board of Directors. Meeting twice a year, the board approves all by-laws, policies and budgets for the organization. The board sets the vision and goals which the standing committees and staff implement. A list of board members can be found on our website. Promotion is vital in making churches aware of the ministry, training and services that UMVIM, we encourage your church to contact us. Prayer is an important part of our ministry. During our staff meetings, we pray for teams and Individual Volunteers serving, Global Ministries mission personnel and staff, and UMVIM and GBGM projects. Please pray for all those serving through UMVIM but especially for our staff.